Stanley Roofing & Repairs carry out roofing repairs all across county Dublin. With years of experience in the roofing repairs industry, we have seen countless damaged roofs and repaired them. We provide once off repairs, as well as ongoing maintenance for all our clients roofs in Dublin. Stanley Roofing & Repairs offer free quotes and are known for being competitive, while never compromising on quality and workmanship. Whatever the reason, Stanley Roofing & Repairs Dublin are on hand 24 hours a day, seven days a week to quickly repair any damage. We also carry out an assessment of your existing roof and let you know if there are any issues. uPVC Products Stanley Roofing & Repairs we supply and install a range of high quality uPVC products, including fascia, soffit, gutters and downpipes. We work with domestic clients all across county Dublin. We provide our services for domestic clients, working on new homes, as well as carrying out upgrades to commercial buildings. Stanley Roofing & Repairs are a County Dublin based roofing repairs company. We specialise in the repair and maintenance of all types of repairs, from broken slates to leaking roofs. 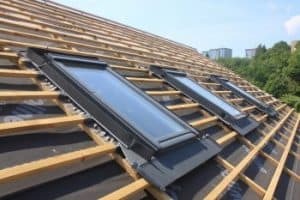 Our comprehensive range of roofing repair services are carried out by a fully qualified team, who have gained a reputation as one of the best in the area. Stanley Roofing & Repairs are fully registered and insured, so have peace of mind you are dealing with professionals. Each and every job is carried out and checked thoroughly to ensure it reaches our high standards, We only use the very best materials, helping to ensure that your roof, chimney, fascia & soffit lasts for years to come.